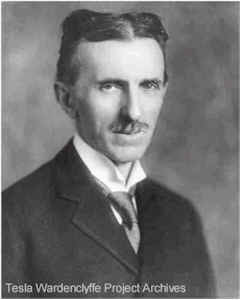 Born in Smiljan, Lika, Croatia of Serbian parents at midnight, July 9-10, 1856 Nikola Tesla would grow up to become one of the world's most influential inventors. His contributions to modern-day society are numerous. They include the rotating magnetic field principle which led to the polyphase alternating-current system of power transmission and the induction motor, as well as the high power radio-frequency electrical oscillator which resulted in the first practical system for radio broadcasting and wireless telecommunications. Some of his other inventions are the modern-day fluorescent light and high-frequency electronic ballast, the electronic logic gate, wireless remote control robotics, frequency-division and frequency hopping spread spectrum communications, and the disc pump and turbine. And, there are some less well-known inventions. He investigated high energy X-ray production, macroscopic charged particle acceleration and other advanced concepts. During his lifetime Tesla gave to the world selflessly. He passed away in his room at the Hotel New Yorker on January 7, 1943.